I’m thinking back to September 2013 … Sitting on the stage of the Queen Elizabeth Hall on London’s South Bank, watching the profile of the man next to me. We have never met but I know his face. Where have I seen it? We are part of an event to pay tribute to Nelson Mandela, while six thousand miles away the man himself is so frail that it will not be long till he is gone. I look around the others – twenty-three of us altogether, writers and performers – we each have three minutes to read, recite, sing – anything of our choice. I wonder about the journeys that have brought each of us here. 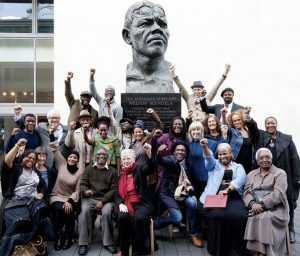 Our origins, or those of our parents, are in South Africa and Jamaica, Nigeria and Guyana, Zimbabwe and St Lucia, Nigeria, Ethiopia, Eritrea, Malawi – a microcosm of those who have lived with the experience of racism and challenged it, and for whom the world is different because of how Mandela lived his life – choosing, at every point, and never the easy choices. Framing our personal tributes, two British actors take it in turns to read extracts from Mandela’s autobiography. The man next to me is one of them. It’s no easy task, for Mandela’s prose, like his spoken delivery, is rather pedestrian. It was always striking when he spoke in public that for a man of such magnetic qualities his voice had a flat intonation that in anyone else would have been boring – he held his audiences entirely by the moral authority of what he said. How can anyone else convey through those plain words the spirit that inspired millions? Yet this man next to me does it, quietly, and with no superimposed drama. It’s all in the timing, I think – he has found the significant word in each phrase, to drop into a waiting space. Suddenly memory breaks through. In a rehearsal pause I turn to him and say, ‘Are you Brutus?’ Yes, he is! A year ago I had watched him in a Royal Shakespeare Company production of Julius Caesar set in Africa, with an all black cast. Until then I had not focused on the fact that it is above all Brutus’s play, and it’s this man who brought it home to me. He was Brutus – his intensity, his inner vacillation, the compulsion of the emotions that drove him. Now that skill, that human understanding, will bring Mandela’s voice to an audience of 900. His name is Paterson Joseph – anyone in the UK who watches TV more than I do would have had no difficulty recognising him. Even I should have known, for I have seen him in other stunning lead roles in theatre – Atahuallpa, the Inca king-god in Peter Shaffer’s The Royal Hunt of the Sun, and in Eugene O’Neill’s Emperor Jones, about a black American escaped prisoner who set himself up as dictator of a small Caribbean island. Paterson is one of Britain’s outstandingly talented actors, an achievement even more remarkable given his no-privileges-hard-working-immigrant background. When I tell him I was touched by his reading he says, with a slight shrug, ‘It is my job.’ It’s the perfect answer. No false modesty – he knows he’s good, why wouldn’t he? But it speaks also of what goes into producing such unobtrusive skill. It’s his job. It’s what he has chosen to do with his life, and he makes sure he does it well. Faced with all that’s going wrong in the world, what can any of us do to make things better? I take courage from many examples that have come my way, of people who think of themselves as ‘ordinary’ but do extraordinary things. Last December my friend Liza decided she couldn’t live with knowing what was happening to fleeing Syrian refugees, so took four weeks out of her life to go and help receive those arriving in boats on Lesbos. She does not have a simplistic idea that individual efforts alone can change the world. In her day job in international development she is conscious of the need to work for more systemic solutions to problems, that will last because they are embedded in society’s structures. But there are moments when the immediate pressure of someone else’s need pushes other considerations aside. She and hundreds like her were feeding and providing warm clothing to 6,000 people a day, and then taking them on to reception camps. Without them, many of those people would not have survived. What happens to them now, and to refugees everywhere, is all of our concern, and we need to find other ways of responding. For people who can’t drop everything and go to trouble spots, there are many quieter ways, a myriad forms of volunteer activity that help make these and other disastrous situations more manageable, that bring light into struggling lives – and always also into the lives of those who volunteer. Wherever we live, there are issues to be tackled, campaigns to be waged, practical tasks to be done. Not least, there are values that we share by living them, that we pass on to our children, who may in their turn make things around them a little better. We have only to take one step at a time, to do only what seems possible for each of us. 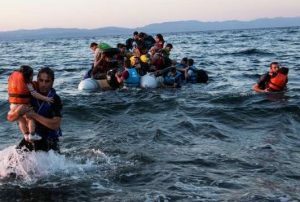 It may be going off to Lesbos, it may be looking after children, it may be campaigning. What Paterson does, is he allows us to feel inside the people whose voice he becomes. That’s his job; and through it, like any great artist, he helps us grow, become more human. And I? What do I do? Many days it feels, not much. But I hold onto the advice of my friend, Ralph Russell, who was born in the same year as Mandela, lived almost as long, and reflected constantly on his personal values. He didn’t change the world, but because of his influence scores of people live a little differently – and better; and I am one. He used to say ‘You need to work out, of all the things you could do with your time, which ones only you can do, and focus on those.’ For me, a step towards clarity came from an early reviewer who said, ‘She writes with great simplicity about ordinary people, yet that ordinariness is universal.’ It’s a comment I have always valued. I have discovered that I can tell stories – personal stories, but set against the bigger issues of life – in a way that helps people empathise with situations other than their own. That’s what I do; that’s my job. I’m looking now at a group photo that was taken at the end of that Mandela event, three years ago. We’re all celebrating – the privilege of being invited to publicly share our identification with all this man stood for, and the brief companionship it created among strangers. It’s through these small things that the world moves forward, one step at a time. 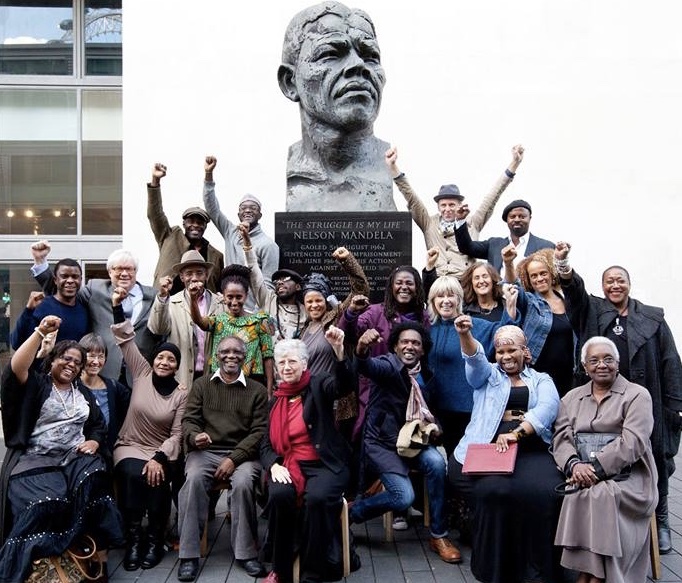 Credits: Thanks to Paterson Joseph and Liza Lort-Phillips for inspiration; Caroline Worsley and Lisa Conway for inviting me to talk at a conference of the National Women’s Register in Salisbury; Hannah Poole for inviting me to be part of the Mandela event. The organisations with whom Liza worked on Lesbos are the Starfish Foundation and the Volunteer Co-ordination Agency. The review comment is by Mary Loudon, from The Independent, about A Shield of Coolest Air. 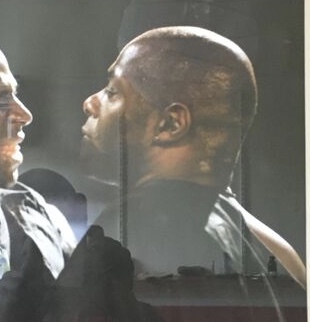 The photo of Paterson Joseph as Brutus is from a poster for the Moscow Art Theatre run of Julius Caesar, with Cyril Nri as Cassius. His most recent UK theatre role was Sancho, in the one-man show which he also wrote. Many thanks for this very inspirational piece of writing. I too have been struggling to think ‘what can I do?’ I’m not a writer or an actor. I can’t or at least don’t make speeches using mine or others’ words and I can’t go to Lesbos or the jungle at Calais……. I felt a stab of relief as I read your blog: I do believe too, that it is the accumulation of little things that may help. I think one of those little things is to meet any personal conflicts swallowing resentful words / nasty retorts and just button my mouth and be silent. I guess that’s what I’ll keep doing ! Thank you very much for the reminder…..
An inspiring read Marion! I value Ralph’s advice but It’s finding and defining that thing that only you can do which is half the problem! In the meantime we carry on doing the little things we do which we hope are making some difference to those around us. I like the comment, it’s my job. Thinking in this way, putting it simply like this can validate what we do and make us think that whatever we do we should do it well. At this very tense time in the Sub-continent, reading this makes it easier to stay sane and focused! me and doing it as well as possible, however small my contribution. When I worked on child participation, with many groups that were working towards making another world possible, I realised we as humanitarian workers need first to make the world a better place within our own spaces. For me it meant raising my own consciousness – to communicate and join hands with like minded people. The search goes on! Reading Uncertain Light was a revelation – how we from this part of the world (India) can integrate with people like the characters brought out through your eyes, and by working together make it a better place! Join hands, hearts and souls with hope, strength and fortitude. Loved the blog! Marion, you touch a corner in my heart – or it is a reflection of what is already in my mind. During the women’s lib movt we had consciousness-raising groups, all about ourselves. I think now we should have conscienceness raising groups, about our world and ourselves in relation to it, what we are doing for it, how we can link our daily lives to others on the planet. I for one need help – ideas for ways to belong to a human network in reality, not just in my thoughts as I stir the porridge. A small group network could be inspirational, a spur to action. Another thing one can do is host an asylum seeker or refugee in one’s home. I hosted a very pleasant woman from Uganda for three weeks. There are at least two organisations that organise this: Refugees at Home and Room for Refugees. Referrals to them come from the Red Cross and the Refugee Council. In our current dire times, we need such conversations as you have initiated above as well as those conversations in the head… whether with people we know, people we have read, or even our better selves, who will remind us of the necessity of hope and ‘one step at a time’.